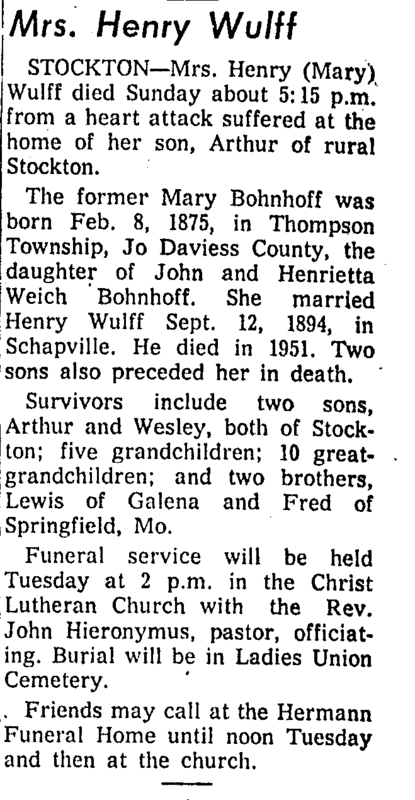 While I was researching the Wulff’s, I came across this obituary for Mrs. Henry (Mary) Wulff on page 4 of the Freeport Journal-Standard, Monday, May 19, 1958. Her relationship to me: wife of 2nd great grand uncle. Stockton—Mrs. Henry (Mary) Wulff died Sunday about 5:15 p.m. from a heart attack suffered at the home of her son, Arthur of rural Stockton. Survivors include two sons, Arthur and Wesley, both of Stockton; five grandchildren; 10 great-grandchildren; and two brothers, Lewis of Galena and Fred of Springfield, Mo. Funeral service will be held Tuesday at 2 p.m. in the Christ Lutheran church with the Rev John Hieronymus, pastor, officiating. Burial will be in Ladies Union Cemetery. Friends may call at the Hermann Funeral Home until noon Tuesday and then at the church. I was researching Henry Wulff Sr, who is my 3rd great grandfather. He was born in Germany and died in Schapville, Illinois. His wife was Maria Sophia Schumacher and they had three children, Carolina Sophia, Henry Jr., and Anna Marie. I found this obituary in the Freeport Journal-Standard. It was published January 3, 1929. Elizabeth, Ill., Jan. 2 – Funeral services were conducted at Schapville, a few miles north of this city, on Sunday morning at 11 o’clock at the Schapville Lutheran church at the Schapville Lutheran church for Henry P.[sic] Wulff, aged resident of that community for the past 45 years, who passed away on Thursday at the age of 84 years. The services were conducted by the pastor, the Rev. Otto C. Moke, and burial was made at the Lutheran cemetery adjoining the church. 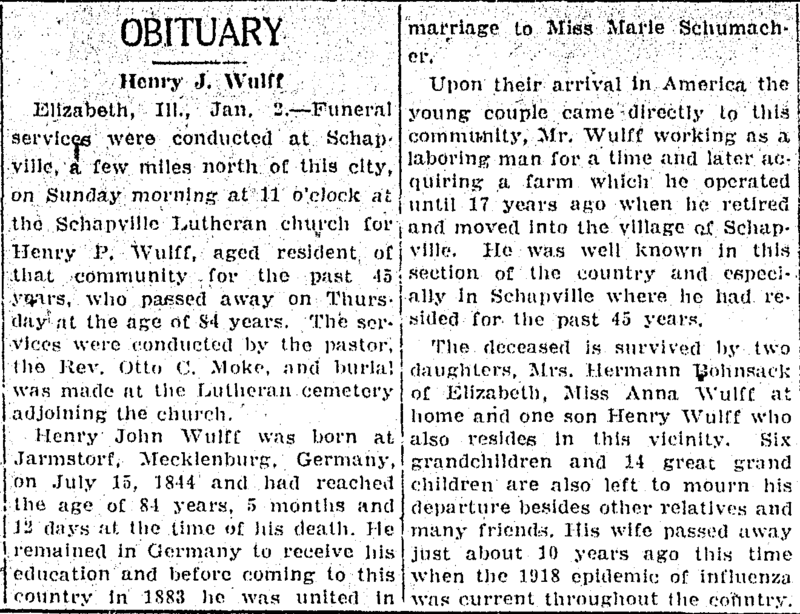 Henry John Wulff was born at Jarmstorf, Mecklenburg, Germany, on July 15, 1844 and had reached the age of 84 years, 5 months and 12 days at the time of his death. He remained in Germany to receive his education and before coming to this country in 1883 he was united in marriage to Miss Marie Schumacher. Upon their arrival in America the young couple came directly to this community, Mr. Wulff working as a laboring man for a time and later acquiring a farm which he operated until 17 years ago when he retired and moved into the village of Schapville. He was well known in this section of the country and especially in Schapville where he had resided for the past 45 years. The deceased is survived by two daughters, Mrs. Hermann Bohnsack of Elizabeth, Miss Anna Wulff at home and one son Henry Wulff who aslo resides in this vicinity. Six grandchildren and 14 great grandchildren are also left to mourn his departure besides other relatives and many friends. His wife passed away just about 10 years ago this time when the 1918 epidemic of influenza was current throughout the country. His daughter, Mrs. Hermann Bohnsack, aka Carolina Sophia or Lena, was my great-great grandmother. Her husband’s full name was Carl Herman Bohnsack. I think it’s interesting that they say his wife, Maria (Schumacher), died “when the 1918 epidemic of influenza was current throughout the country.” I wonder if this means she died of influenza? Something I’ll have to explore. Have you ever hit a wall with your research of an ancestor? 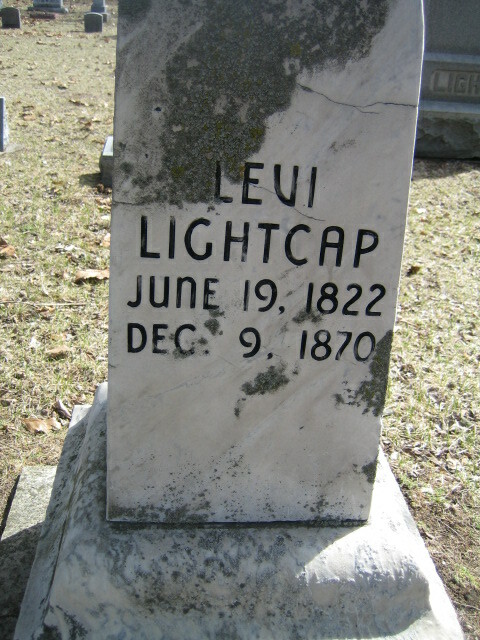 I have, many times, but my current stumbling block is Levi Lightcap, my 3rd great grandfather. More specifically, I’m having trouble identifying his parents. All I know is that he was born in New Jersey. Other than that, it’s pure speculation as to who his parents and siblings are. I’ve been stumped so much that I set up an appointment in July to meet with a researcher at the Genealogy Center at the Allen County Public Library in Fort Wayne, Indiana. For those unfamiliar, this is the largest repository for genealogical research in the Midwest. In fact, it’s second only to Salt Lake City as a genealogical resource in the United States. Anyway, I forwarded about 60 pages of research to them that I hope will generate some leads. There’s been research done on other Lightcap’s, but none involving Levi. I’ve found researchers who link him to a brother, but have nothing that verifies this assertion. Verification is key. Without it, assertions means nothing. I’ve not seen any researcher with information about his parents. I hope that the Genealogical Center researcher can help. Since Levi died in North Judson, Indiana, and suffered a strange death (he was accidentally shot at work while his son struggled with another man over a gun), I’m hoping they have more information. The newspaper articles I’ve found have been of little assistance, except a few days ago I found an article in the Wisconsin State Journal that said that three men were arrested after Levi was shot, including his son. Maybe there’s police documentation that’s available. But I have no idea how to go about getting arrest records, or even if that’s possible. I’m writing this down as a research line to pursue in the future. I’ve been researching my family history for about 10 years, give or take. About 5 years ago, I gave up using software that needed to be installed on a computer. Instead I use ancestry.com’s system. It allows for me to collaborate with my mom about research and let other family members look at it. If it was only on my computer, I would not have the collaborative opportunity. Whether this is a good or bad thing is open to debate. Anyway, one of the drawbacks to using a proprietary system like ancestry.com is that those who are not subscribers cannot access research and collaborate. This blog is another way for me – hopefully – to make connections with people who may be researching the same family names. My primary research is focused on ancestors from England and Germany. After they immigrated, they settled in the Midwest, primarily in Illinois, Iowa, Wisconsin, Ohio, and Indiana. Some family names are: Lightcap, Strelesky, Bausman, Deininger, Wulff, Doose, Hebenstreit, and Davis.